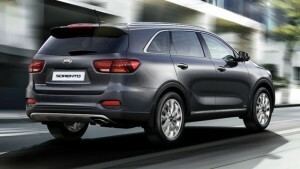 Alongside the facelifted Kia Optima and Grand Carnival, the facelifted Sorento has also quietly appeared on Kia’s Malaysian website. As with the others, the updated seven-seater SUV gets a new look, a revised kit list and a new transmission for the diesel model. The previous four-variant lineup has been simplified – there’s now just one petrol and diesel variant each, the 2.4 EX and 2.2D SX, and while pricing has yet to be released, the website lists a starting price of RM169,888. That’s exactly the same price as the current 2.4 EX variant after the introduction of the sales and services tax (SST), so the 2.2D SX will likely also hold station at RM179,888. Revisions to the design include a new front fascia incorporating a reshaped “tiger nose” grille and reprofiled air intakes, plus standard adaptive LED headlights in a triple projector design. The fog lights also get the “ice cube” LED design that were previously only available in selected markets. At the back, there are redesigned internal graphics for the LED tail lights and a new rear bumper design with fake air vents below the rear fog lights. Completing the look are new two-tone alloy designs, measuring 18 inches on the EX and a massive 19 inches on the SX. Inside, the Sorento gets a new four-spoke multifunction steering wheel with a round protrusion on the airbag boss, revised seven-inch instrument display graphics and climate control switchgear and greater use of leather, soft-touch plastics and gloss black trim. Also added are driver’s seat memory, Qi wireless smartphone charging and Apple CarPlay and Android Auto functionality on both models. In fact, equipment is largely identical on the EX and SX and includes keyless entry, push-button start, an acoustic and solar-attenuating windscreen, auto lights and wipers, dual-zone climate control with rear air vents and third-row temperature control, eight-way powered front seats, rear side window sunshades, an auto-dimming rear-view mirror, a touchscreen infotainment system and a handsfree powered tailgate. Safety-wise, both models come with six airbags, ABS with EBD and brake assist, hill start assist, hill descent control, ISOFIX second-row child seat anchors, a tyre pressure monitoring system, a reverse camera and front and rear parking sensors. Unfortunately, like the Stinger and the other newly facelifted models, you don’t get autonomous emergency braking here. 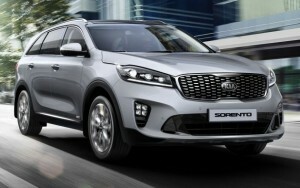 The Sorento soldiers on with the same two engines as before – a 2.4 litre Theta II MPI petrol four-cylinder producing 172 PS at 6,000 rpm and 225 Nm of torque at 4,000 rpm, as well as a 2.2 litre R turbodiesel with start/stop making 200 PS at 3,800 rpm and 442 Nm from 1,750 to 2,750 rpm. A new eight-speed automatic transmission replaces the six-speed unit on the diesel, and on-demand all-wheel drive comes as standard.